Earlier this year, the City of Winnipeg invited members of the public and interested organizations to fill out an accessibility survey. The City recognizes that barriers to accessibility may create difficulties for some people to fully participate in activities of daily living. We want to learn about what the community considers policy and procedural barriers to accessing City facilities and services. 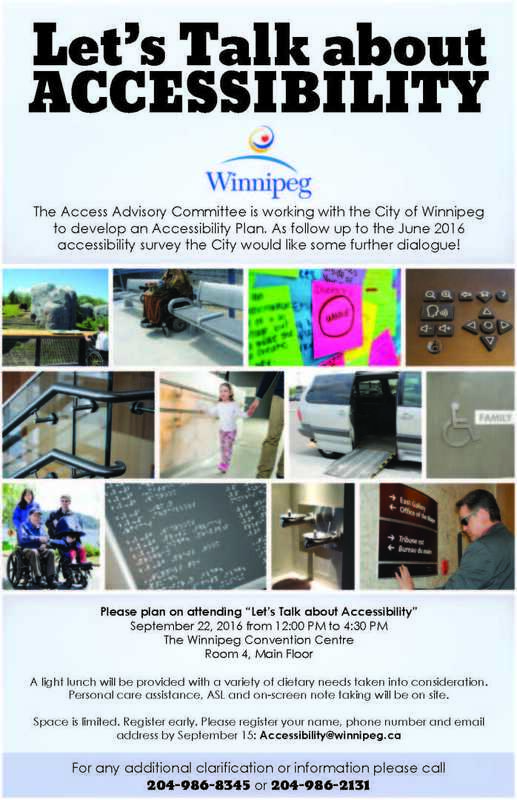 As the next step in this ongoing process, the City’s Access Advisory Committee is hosting an event on September 22 to discuss information obtained from the accessibility survey. To attend, please pre-register before the deadline of September 15 (see details below). The Access Advisory Committee, as part of their biannual community check in, is working with City Administration on the development of an accessibility plan in response to fulfill the legislative requirements indicated in the Accessibility for Manitobans Act (AMA). The Accessibility Plan will be used to identify, prevent and remove barriers that prevent full citizen participation. As part of the City’s commitment to ensuring inclusion and transparency it has conducted an Accessibility Survey to learn about what the community identifies as barriers to accessing City facilities, services and information. 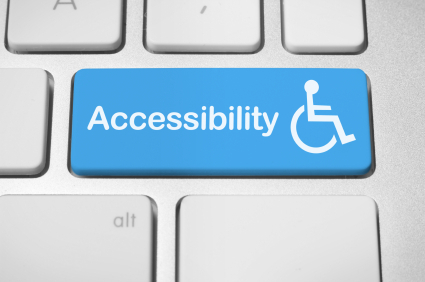 The results have been analyzed and the information collected has been used to begin to establish a baseline Accessibility Plan. Three rooms will be available to facilitate open discussion focused around each of the top three areas ranked for barrier identification, prevention and removal, as indicated by the survey results. The facilitated discussions aim to produce positive, realistic actions and solutions from the information we have heard from the accessibility survey. A light lunch will be provided with a variety of dietary needs taken into consideration. Personal care assistance, ASL and on-screen note taking will be on site. Space is limited. Register early. For information, please call 204-986-8345 or 204-986-2131.